29.16a. A man having a tooth pulled--a first in Staffordshire figures. Stylistically, it reminds me of 29.16, and I wonder if the same potbank made both. 29.21a. 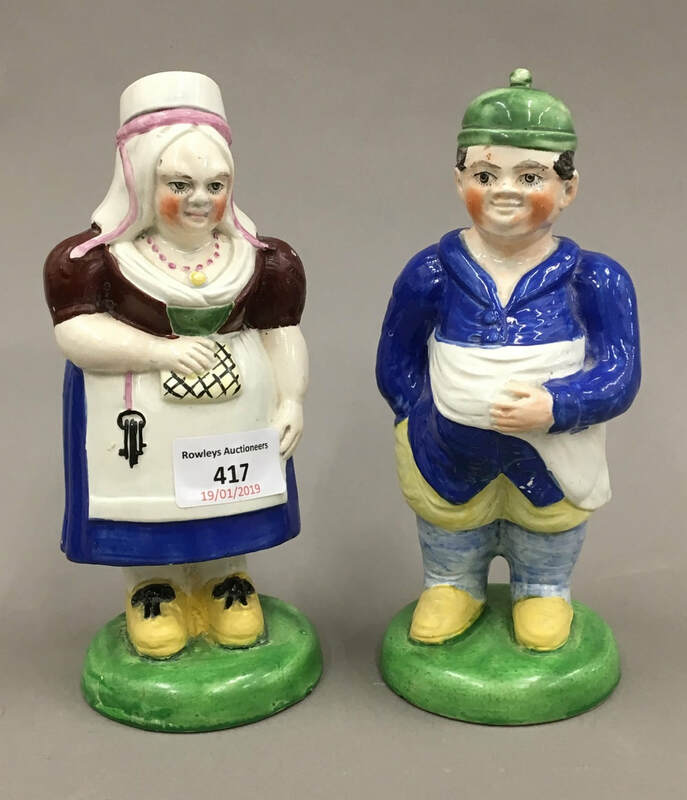 The land lady, like the one in 29.21, is here shown with her companion, hitherto unrecorded. Courtesy Rowley's Auctions. 29.34b. Like 29.34 but on a round base. 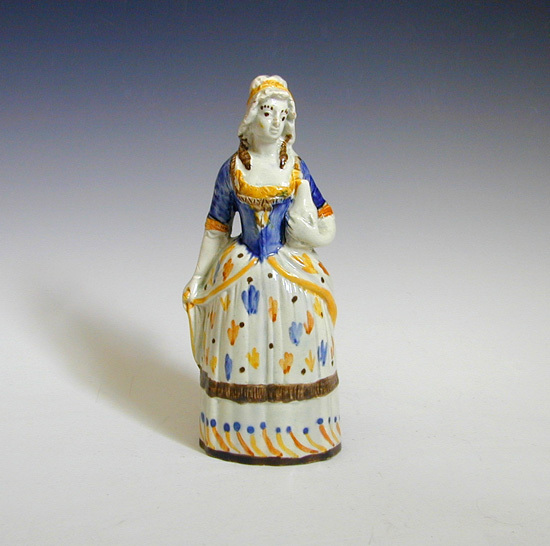 Don't know of another like it--the square-base figure is very rare (I know of about 4, 2 of which are in museums). 29.35a. I was very excited to find this oh-so-rare blacksmith (same figure as 29.35) on a very unexpected base. 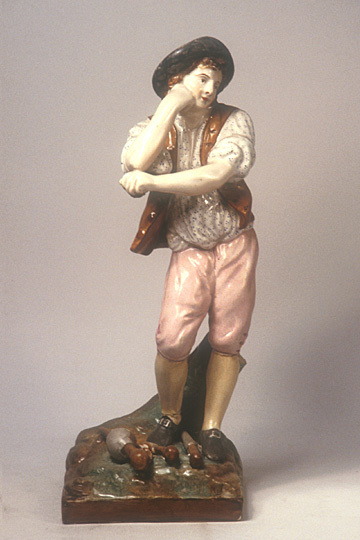 Bases of this form are usually on animal figures. 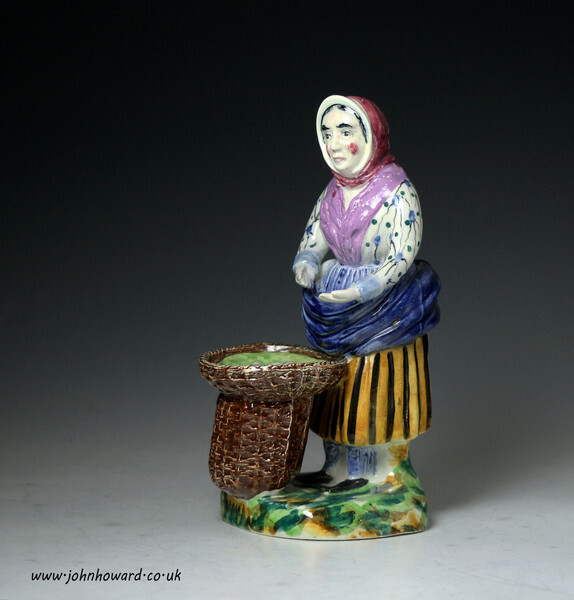 29.38a Scottish Fisherwoman on a different base. Probably made in Scotland. 29.45. 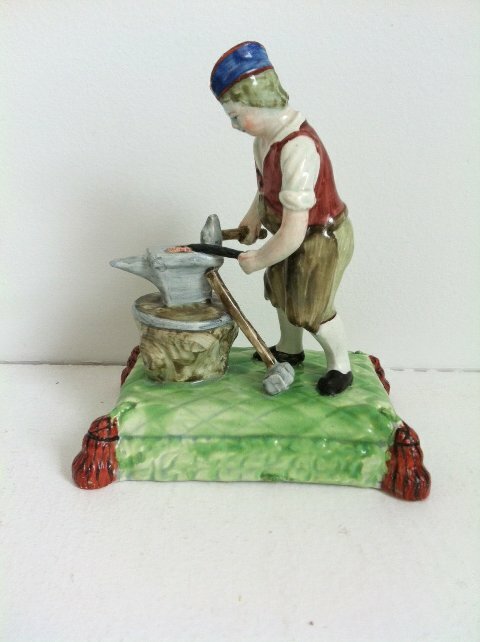 I described this figure as a butcher boy...and maybe he is. On the other hand, just before vol. 2 went to publication, I realized that the resemblance to Sam Swipes is strong. So I show this figure again in vol. 2, and I don think he should be reclassified as Sam Swipes. 29.54a. 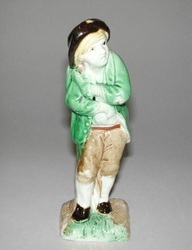 This figure, otherwise unrecorded, is made from molds used in 29.54. I suspect it was made by the same potbank that made 109.17 as the bocages, including the trunk, are structured similarly. 29.57. 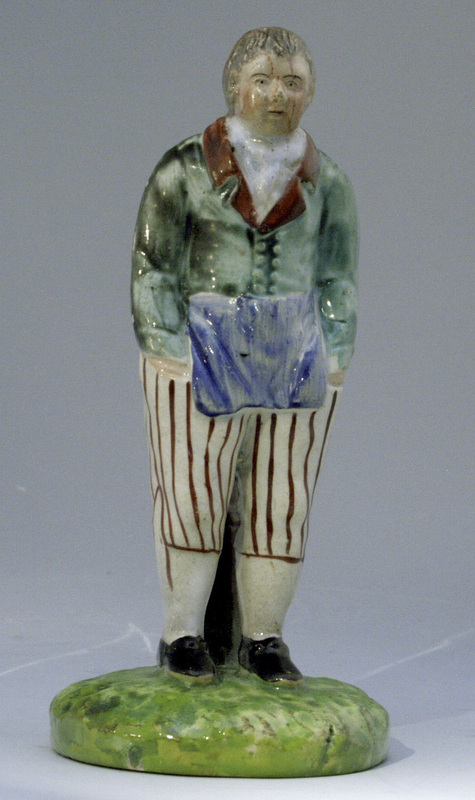 The worst picture...but I have no other record of this figure of a drayman, apparently enamel-painted, that was once in the stock of Jonathan Horne. 29.58. In the Brighton and Hove Museums and described as having draining equipment at his feet, which would make his occupation...what???? 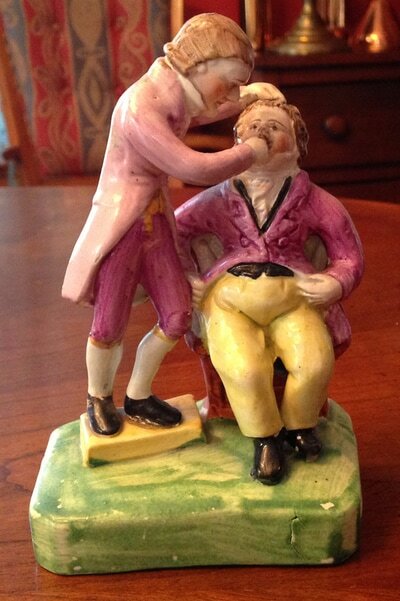 I am not totally certain this is an English figure. 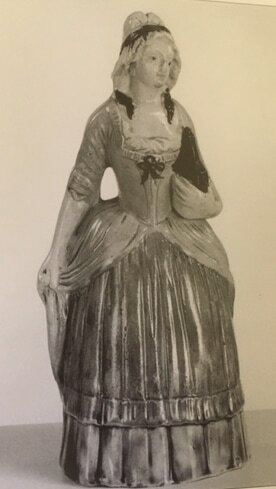 This tavern wench in the British Museum is as shown in Griselda Lewis's "Pratt Ware," third edition. She is naked beneath. See 29.23 for an enamel-painted counterpart. 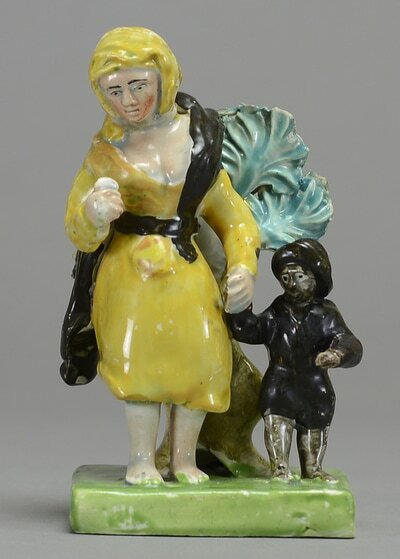 The bawdy barmaid, here in Pratt colors. 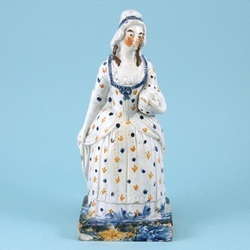 See 29.23 - 26 for enamel painted versions. 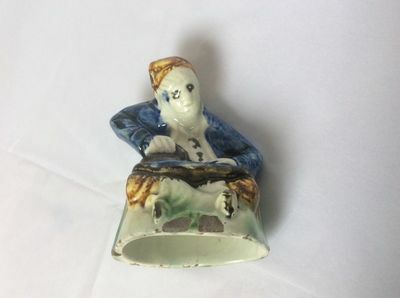 I do not know if this is a "naughty model" or if the base is closed off. 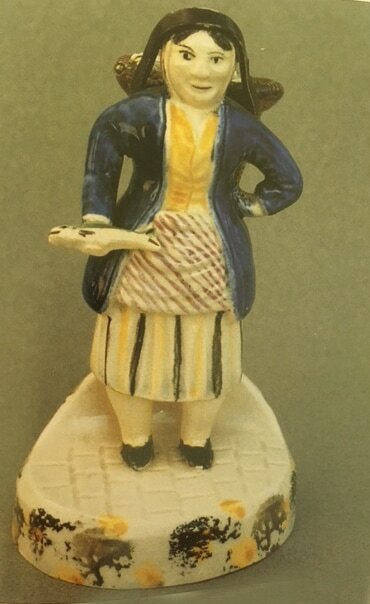 Another bawdy barmaid in Pratt colors, this time atop a square base, so nothing naughty to see from beneath. Courtesy Andrew Dando. The gentleman ironing is said to be a tailor.. Courtesy Martyn Edgell. 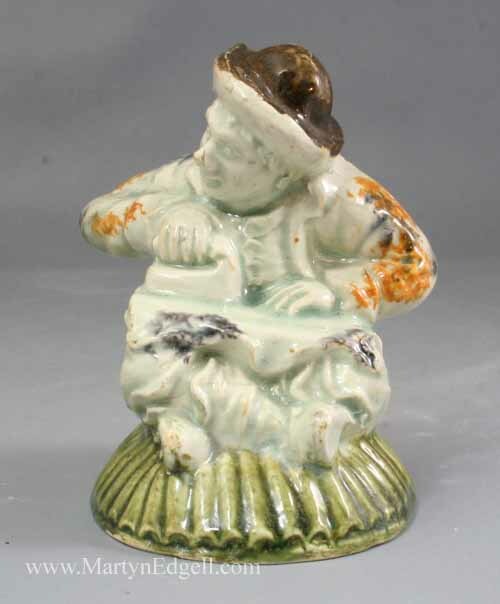 Like the previous figure, said to be a tailor, but the head is different. .
Ralph Wood figure like the sweep in figure 29.29 but decorated in colored glazes. 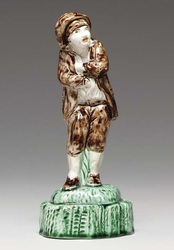 The same figure form is used to portray Winter and a clown...so take your pick when it comes to the title. 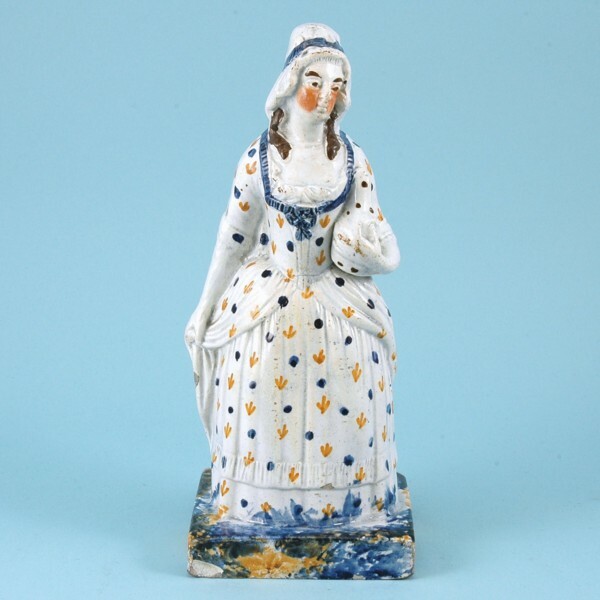 (c) Fitzwilliam Museum, Cambridge. Like the previous figure. Read all about it in that figure's caption. Made in Scotland, probably at Watson's Pottery, Prestonpans. Courtesy Andrew Dando. H: 8.3". 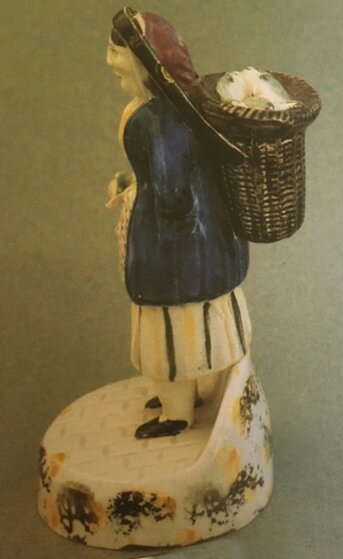 Made in Scotland, probably at Watson's Pottery, Prestonpans. Courtesy John Howard. Fisherwoman, made in Scotland. 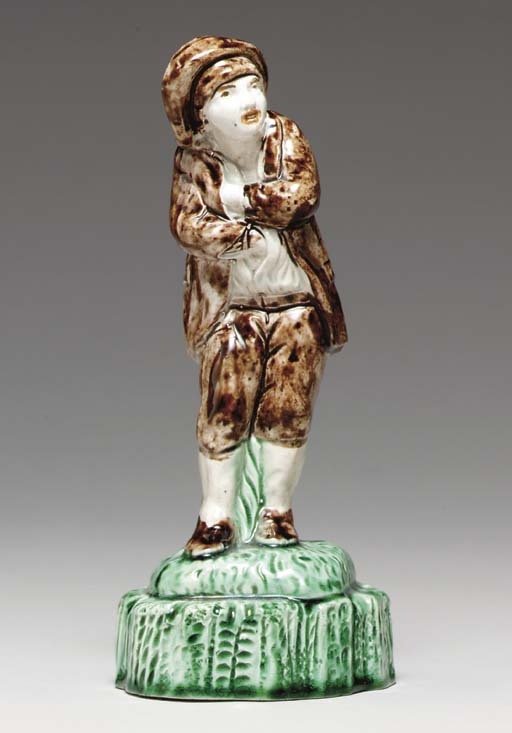 As shown in Griselda Lewis's "Pratt Ware," third edition. 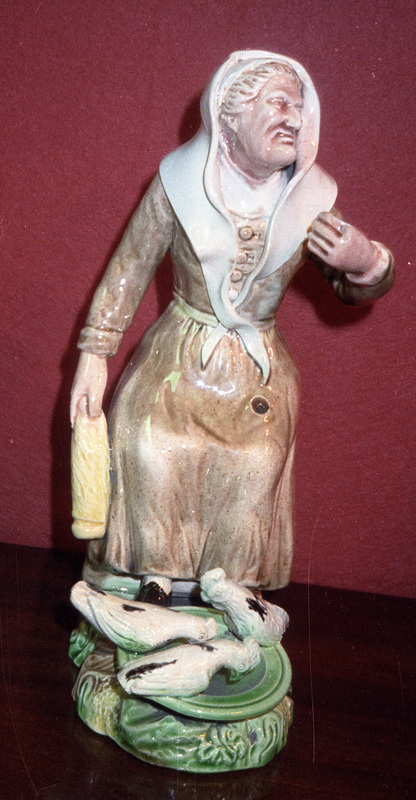 Side view of previously shown figure as shown in Griselda Lewis's "Pratt Ware," third edition. Attributed to Ralph Wood. Same as 29.39 but decorated in colored glazes. 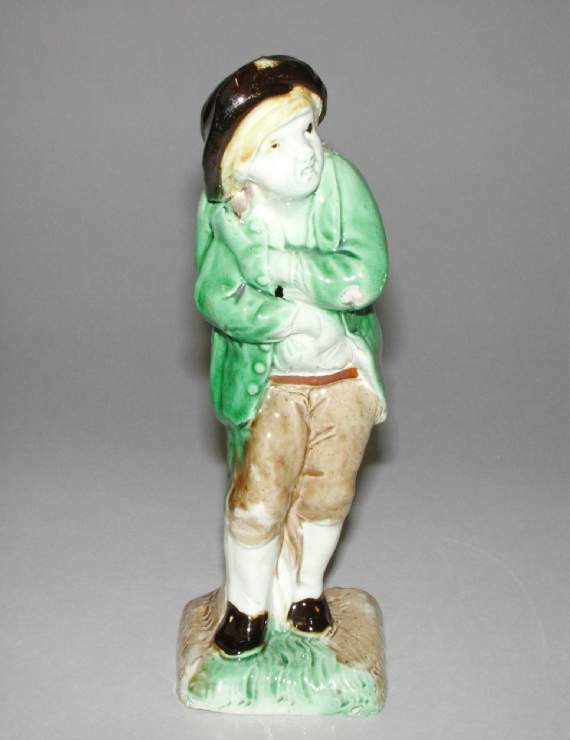 I was thrilled to discover this unrecorded Tittensor figure in a private collection. It is impressed TITTENSOR on the reverse. 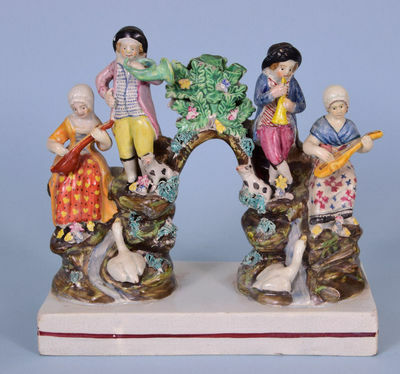 As I have previously observed, Tittensor used different flowers on the bocages of enamel-painted and underglaze decorated figures.